HÀ NỘI – Việt Nam’s benchmark VN-Index extended its rally on Wednesday for the eighth consecutive session as investor confidence was lifted by expectations of the Government selling its stakes in listed companies. The VN-Index on the HCM Stock Exchange rose 1.16 per cent to close at 952.14 points. It has gained total 6.9 per cent in the last eight consecutive sessions. Gainers outnumbered losing stocks by 149 to 124, while 54 other stocks ended flat. 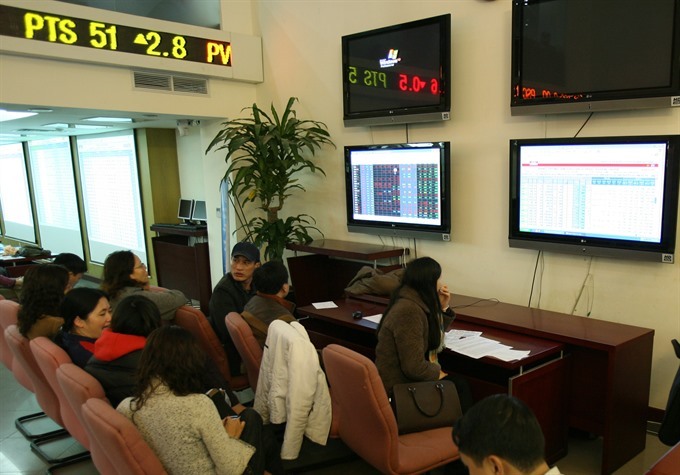 More than 229.8 million shares were traded on the southern bourse, worth VNĐ5.53 trillion (US$246 million). Trading liquidity declined by 36 per cent in volume and 37.4 per cent in value compared to Tuesday’s figures. Two-thirds of the 30 largest stocks by market capitalisation in the VN30 Index advanced, lifting the large-cap index by 1.16 per cent to hit 946.55 points. The southern market on Wednesday recorded big increases of listed companies in which investors expect the Government will soon offload its ownership. Those companies included Bình Minh Plastic JSC (BMP) and brewers Sabeco (SAB) and Habeco (BHN). At Sabeco’s roadshow on Wednesday, the Ministry of Industry and Trade announced it would auction 343.7 million shares in the company, equal to 53.59 per cent of the brewer’s capital, at the initial price of VNĐ320,000 per share. Sabeco shares were boosted 5.9 per cent following the announcement, hitting VNĐ339,000 per share at the end of the session. The rise of Sabeco shares also had positive impacts on other State-run companies like Habeco and Bình Minh Plastic. Habeco shares surged 7 per cent, reaching its daily increase limit while BMP jumped 4 per cent. Other large-cap stocks also performed well, such as insurance-finance group Bảo Việt Holdings (BVH), Thành Thành Công Tây Ninh Sugar JSC (SBT), Sacombank (STB), Vietinbank (CTG) and MBBank (MBB). According to Bảo Việt Securities (BVSC) analysts, the VN Index is expected to extend growth further to approach the range of 975-980 points following Wednesday’s strong showing. “Though trading liquidity fell sharply from the previous session, it remained above the average of the last 21 sessions and made investors more optimistic and excited about the future prospects of the market,” they said in the company’s daily report. The benchmark index is forecast to rise and touch the 955-point level in the short-term, according to BVSC, however, analysts warned investors should be cautious as the market was mainly driven by large-cap stocks, signaling unsustainable development at the moment. On the Hà Nội Stock Exchange, the HNX Index rose 2.20 per cent to end at 113.95 points, recovering from Tuesday’s decline of 0.47 per cent.